During your senior year of high school, you have a lot to deal with. You’ve got to maintain your grades, apply to colleges, make sure your standardized tests are completed, find scholarships, fill out financial aid forms, and still manage to have a great last year with friends. Who are you supposed to turn to when you have questions? There is one person who can help with all of it—your guidance counselor, a valuable, knowledgeable, and probably under-utilized resource. 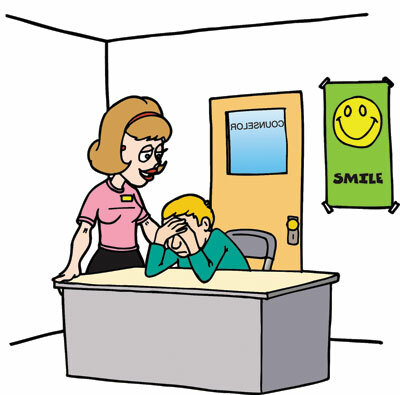 “Having a good relationship with your guidance counselor is extremely important. In your senior year, you need a lot from your counselor, including letters of recommendation and help figuring out applications for colleges and scholarships,” says Kathy, a high school guidance counselor from Florida who requested that her name be withheld. Counselors have access to many resources students may be unaware of. Scholarships come into guidance offices and are distributed to counselors before they reach students. They also have strong relationships with local, state, and national colleges. It is important to get to know your counselor early on, so assistance can be tailored for you. Establishing a relationship freshman year can enable your counselor to monitor your grades and test scores, track progress with applications and essays, help you find internships or apprenticeships, and make suggestions on universities, majors, and financial aid. They can even help prepare you for job interviews. Not all students have strong relationships with their counselors. Some do not ask questions or tap into counselors’ resources. Others are unaware of how helpful they are. Guidance counselors can be a sounding board for career decisions, provide input and advice based on students’ personal histories, and answer tough questions. Forming a good relationship with your counselor can be one of the most beneficial tools for students. After all, getting ready for the real world on your own can be pretty overwhelming!